Albrecht Dürer (German pronunciation: [ˈalbʁɛçt ˈdyːʁɐ]; 21 May 1471 – 6 April 1528) was a German painter, printmaker, mathematician, engraver, and theorist from Nuremberg. 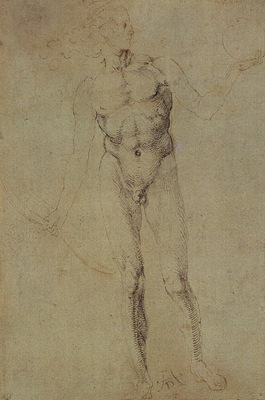 His prints established his reputation across Europe when he was still in his twenties, and he has been conventionally regarded as the greatest artist of the Northern Renaissance ever since. His vast body of work includes altarpieces and religious works, numerous portraits and self-portraits, and copper engravings. His woodcuts, such as the Apocalypse series (1498), retain a more Gothic flavour than the rest of his work. His well-known works include the Knight, Death, and the Devil (1513), Saint Jerome in his Study (1514) and Melencolia I (1514), which has been the subject of extensive analysis and interpretation. His watercolours mark him as one of the first European landscape artists, while his ambitious woodcuts revolutionized the potential of that medium.